It’s pear season y’all! I’ve been allowed to harvest a few pears from trees around town so I’ve been making and canning lots of pears. From RancherMan’s favorite Pear Preserves as well as my fave: Pears in Light Syrup. (links at the bottom of the post) We’ll enjoy them all winter long and some jars could also end up in a few of our Homemade Christmas Baskets this year. But a friend from church mentioned she had several pears that were given to her and she was going to make a pear cake with them. Now I amended her handwritten recipe since it didn’t indicate what size pan to bake it in. (although she did tell me that a tube pan would be appropriate.) But her cake seemed to have much less thickness than the batter that I poured into my tube pan. And her baking time was less, so her pan must have been a different size. Plus since it was plenty moist with all that fruit included I substituted the oil in her recipe with applesauce. I also reduced the amount of nuts and also added a bit of vanilla. So I’ll share the recipe as I amended it. RancherMan says it’s delicious and it’s a KEEPER! First I washed several ripe pears and chopped & cored 4 cups worth. (I actually did 8 cups because I wanted to make TWO cakes, one in a 10″ tube pan and one in a 9″ x 9″ glass dish to freeze for later) My friend told me I didn’t even need to peel the pears so I didn’t. Then for each batch I used a fork to mix up 2 eggs in a small measuring cup & poured them over the chopped pears. I used my big honkin’ rubber spatula to mix everything together. Then I added two cups of sugar, 1/2 cup Homemade Applesauce, 2 Tablespoons cinnamon, 2 cups of flour, 2 teaspoons of baking soda, 1 tsp vanilla, 1 tsp of salt and 1 cup of chopped nuts, stirring with my spatula after each ingredient was added. That’s all there is to it y’all! Then I greased & floured my 10″ tube pan as well as my 9″ x 9″ baking dish and poured in each batch of batter. I’m sure cooking spray would have been fine instead but I wanted to follow her directions. I baked the cakes in the oven together at 350 degrees for 1 hour. The cake in the tube pan was done but the cake in the baking dish looked a little underdone in the middle. So I turned the oven off & left the baking dish in the oven soaking up residual heat for an additional 15 minutes. After that extra time the cake seemed to come out about right. I allowed them to each cool for about 15 minutes in their pans before inverting the tube pan onto a plate to release the cake and allow it to completely cool. I sprinkled a little powdered sugar on top just to make it prettiful and served up a warm slice to RancherMan. His verdict? DELICIOUS! Since my friend told me these cakes freeze beautifully I’ll wrap the square cake for the freezer. That way I’ll have a homemade cake ready for unexpected company. She also said you could use a food processor to chop the pears even smaller if I liked. But I loved it the way she made it with the small chunks of chopped fruit. 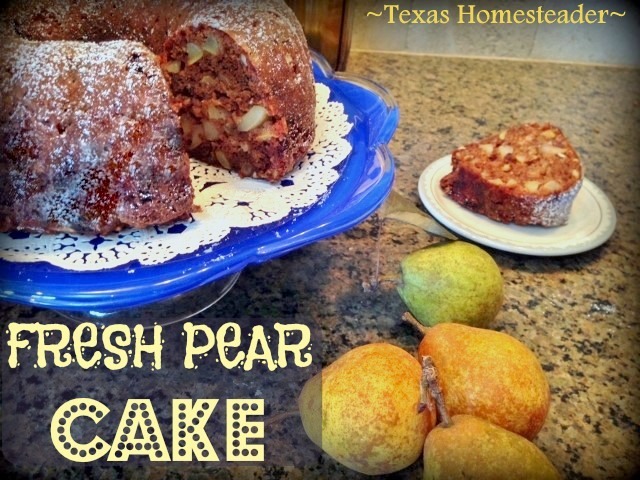 What a delicious way to use up those fresh pears of the season! Mix ingredients in order given, stirring after each addition with a large spoon (do not beat with mixer). Batter will be thick. Pour into a well greased and floured 10" tube pan and bake for 1 hour or until toothpick inserted in center comes out clean. Cool in the pan for 15 minutes and then invert tube pan onto a plate to release cake, then allow to cool completely. Sprinkle powdered sugar on top for garnish if desired. 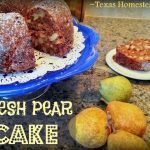 This entry was posted in Blog Posts and tagged Cooking, Fall, Food Preservation, Recipes on October 8, 2015 by Texas Homesteader. This looks Yummy! Thanks for Linking up on My 2 Favorite Things on Thursday! Hope to see you again! Pinned! I love pears in my recipes but dislike eating them fresh. Isn’t that strange? Thanks for sharing at Thursday Favorite Things! You’re so kind Brenda, thank you. Can you please give an approximation of how many pears would make 4 cups? Thank you in advance for your reply. Hummm… I made this cake with tiny eensy pears Tammy, and it took probably about 12 of them to make 4 cups. The other pears shared with me by a sweet friend were much larger and it would only take about 5-6 of them I’d think. I guess it all depends upon how big your pears are. Give this recipe a try and here’s a secret – DANG this cake is even better on day 2! This looks so good. Bookmarking to make later. We loved it Maria, but like I mentioned in another comment – the cake is even better on day 2! This sound delicious! The next time my kids leave behind some squishy pears I will have to make this one. Looks ‘Oh, Sooooo Good’. Bet it’s nice and moist as well. Thanks for sharing the recipe. If you use the ‘Pan Release’ mixture to grease your pans, no need to flour and you won’t have the flour coating on your baked cakes. (saves a step when you don’t have to flour the pan). Just using a pastry brush and coat the pan well your cakes come out of the pan perfectly. Recipe would also be great made into muffins as well. But a little crumb topping on top and bake; adjusting the time of course. Yes Colleen, my friend & I were talking about that too, and that it would shorten the baking time (a good thing if it’s still on the warm side) but I never thought about a crumb topping. That sounds amazing! It really is a moist cake Colleen with all that fruit. The substitution of the applesauce made it a little more cake-textured than my friend’s version but that worked for us. I substituted the applesauce to reduce calories plus I’ve got my own homemade applesauce on the shelves that I made so I could substitute for oil in baking. I also cut the measurement of nuts in half to just 1 cup to reduce both calories as well as cost of the recipe. Since there are just 2 of us here I don’t often bake cakes, but I’d forgotten about the ‘Pan release’ thing, thanks for the reminder. I was able to take my pastry brush & brush off any residual white the flour left behind. I enjoy pears Margy and although our tree is too young to produce yet I’ve been able to to harvest from others excess. Can’t wait until my tree is big enough to produce!